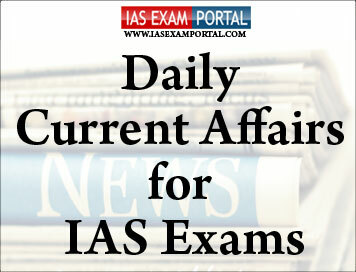 Current Affairs for IAS Exams - 5 September 2018 | IAS EXAM PORTAL - India's Largest Community for UPSC Exam Aspirants. The Ministry of Health and Family Welfare has said that State-level committees consisting of two orthopaedic surgeons or physical medical rehabilitation experts and one radiologist from government hospital, a representative from the Central Drugs Standard Control Organisation (CDSCO) and drug controller of respective States should be formed to identify patients who have received the faulty hip implant by pharmaceutical giant Johnson & Johnson. The committee [of the Ministry which submitted its report recently] has recommended, among other things, the constitution of [a] Central Expert Committee and Regional Expert Committees for determining the exact quantum of compensation after taking into account the minimum amount of Rs. 20 lakh,” the notification stated. The onus of ensuring that the affected patients come forward for compensation was on the government. But all the authorities have been grossly negligent. Former FDA commissioner Mahesh Zagade who filed the FIR said the police initially were very active in the investigation. “I made my staff available for the investigating police officers as the case was not like other routine police matters. The company had approached the court to quash the FIR but they never got an order in their favour,” Mr.Zagade told The Hindu, adding that he later pushed for a CBI inquiry as well. The environment ministry is set to convene this month a “special meeting” of the Genetic Engineering Appraisal Committee (GEAC) to decide on field-trial approvals for the controversial transgenic mustard developed by the University of Delhi’s Centre for Genetic Manipulation of Crop Plants (CGMCP), according to a person familiar with the developments. The CGMCP had earlier applied to grow transgenic mustard (DMH-11) in plots in Delhi and Punjab to test the plant’s effects on honeybees after the GEAC, which had initially cleared the GM crop for “commercial cultivation”, backtracked and demanded more tests and additional data on honeybees and other pollinators and on soil microbial diversity. The GEAC, the apex regulator of transgenic products, had in July put a decision on proposed field trials on hold after some members objected to the use of “unapproved pesticides/herbicides” in the project proposal, according to a record of the meeting made public this week. Environmentalists, farmer groups and some scientists argue that transgenic mustard poses several environmental and health risks. Among these is a contention that it contains a foreign gene from another species, that tests so far have failed to show any appreciable gains in yield over traditional varieties and that it could, if commercially approved, make farmers growing the GM crop dependent on glyphosate — a weedicide that has been linked to cancer. Later in the day, Subhash Chandra Garg, Secretary, Department of Economic Affairs, said that the issue was not so complex and that non-resident Indians (NRIs) were allowed to invest directly in the Indian markets. “NRIs are permitted to invest in Indian securities. There is a limit of 5% up to which NRIs can invest in a single security. When NRIs try to manage funds from others through fund management and register as an FPI ... that is where this issue [comes up]. So, if some NRI is a beneficial owner, then that has been defined. If you have an economic interest as well as you manage, that is not permissible,” explained Mr.Garg. It further stated that FPIs that do not comply with the framework would be given six months to either change their structure or wind up their positions in India. Last month, SEBI extended the deadline to December 31 to comply with the new norms. Suresh Prabhu said that fossil fuel is not going to last for ever even if its resources are managed in the best possible manner. He said that the use of shale gas and oil is limited and it adversely impacts the environment. The threat of climate change has become a reality and it has affected bio-diversity of the planet. The Minister stated that the idea of solar alliance was conceived by Prime Minister, NarendraModi, in 2015 as a treaty based international intergovernmental organization. ISA stands for co-operation among 121 solar rich countries lying fully or partially between the tropics in order to promote massive deployment of solar energy and make solar energy affordable. He said many firms of Australia and Japan are keen to invest in India in solar energy sector. The Minister emphasized on the need for sending market signals so that more funds are invested in R&D in solar energy. India has set a target to generate100 GW solar energy by 2022 for increasing share of carbon free energy in the energy mix. New Delhi hopes the U.S. will consider the importance of its relationship with India carefully, while considering any moves to sanction defence purchases from Russia under the new CAATSA, or Countering America’s Adversaries Through Sanctions Act, official sources said on Tuesday ahead of the inaugural Indo-U.S. 2+2 dialogue. U.S. Secretary of State Mike Pompeo and Secretary of Defence James Mattis will land here on Wednesday and meet External Affairs Minister SushmaSwaraj and Defence Minister NirmalaSitharaman on Thursday, which officials said would be the “highest-level” dialogue between the two countries this year. Our hope is that the U.S. will keep in mind the strategic relationships it enjoys with each country in handling this matter,” an official said, indicating that India would adopt a tough posture during the talks when the CAATSA issue comes up. Another sticky issue remains the U.S. demand that India “zero out” its oil imports from Iran by November, and whether the U.S. will give a waiver to India’s development of the Chabahar port, when a separate set of sanctions kick in. Officials pointed out that India had “independent relations” with all the major powers and sought to dispel any apprehensions that the dialogue would have a negative impact on relations with other countries. A growing number of younger adults, who say they are interested in politics, are nevertheless rejecting formal political engagement in favour of street protest, an Orb Media analysis of data from 9,79,000 people in 128 countries found. Adults under 40 are between 9% and 17% more likely to take part in demonstrations than those older than 40 — a marked increase from the early 2000s, when under-40s were only 3% more likely to protest. Youth have always voted in lower numbers. But while surveys show that democracy remains the most desired form of government, fewer young people take part as volunteers or party members. Other modes of influence, from street demonstrations to digital campaigns, are increasingly prominent.The gap is widening. As more youth choose informal politics, more older adults avoid protest. Youth-led street movements have toppled leaders in Slovakia, Guatemala, Tunisia and Egypt. In each, the establishment reasserted itself. “If young people only employ civil disobedience, they will inevitably be left out of many decisions,” a report by the U.S.-based Consortium for Elections and Political Process Strengthening noted. Two-thirds of non-voters in the 2016 U.S. election were younger than 50. Only one-third of youth approve of Donald Trump as president. The gap is obvious. A Japanese team has developed a “space elevator” and will conduct a first trial this month, blasting off a miniature version on satellites to test the technology. The mini-elevator will travel along the cable from a container in one of the satellites. “It’s going to be the world’s first experiment to test elevator movement in space,” a university spokesman said on Tuesday. The movement of the motorised “elevator” box will be monitored with cameras in the satellites.It is still a far cry from the ultimate beam-me-up goals of the project, which builds on a long history of “space elevator” dreams.The idea was first proposed in 1895 by Russian scientist Konstantin Tsiolkovsky after he saw the Eiffel Tower in Paris, and was revisited nearly a century later in a novel by Arthur C. Clarke. The company has said it could use carbon nanotube technology, which is more than 20 times stronger than steel, to build a lift shaft about 96,000 km above the earth. Argentina’s PatricioHeras has been banned from tennis for five years and fined $25,000 for match-fixing and other related offences. Heras was convicted of contriving the outcome of a match played at the ATP Challenger tournament in Barranquilla, Colombia in September 2015. He is prohibited from competing in, or attending, any sanctioned events organised or recognised by the governing bodies of the sport for the duration of his suspension.The 29-year-old is ranked 307 in singles and has a career-high of 269 achieved in September 2013.